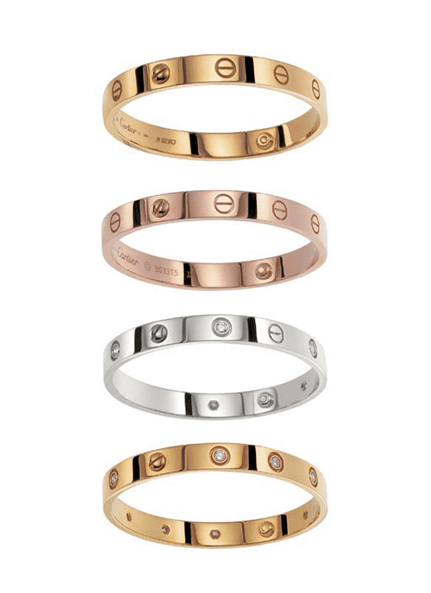 Being an utter romantic at heart and having caviar taste on a tuna budget it makes sense that I’m obsessed with the unattainable (at least for me) Cartier Love Bracelet. The idea is that your true love locks the bracelet on your arm with a little gold screw driver that he keeps near his heart. It’s impossible to get off without the screw driver too so make sure you really love the man that puts it on your wrist. And even if you didn’t, why would you ever want to take it off! The bracelet is gorgeous and the sentiment behind it is beautiful but starting at $5000 and above, it ain’t cheap! If I had this bracelet, I wouldn’t need an engagement ring. One can dream…..